FINANCIAL RESPONSIBILITIES OF LOCAL PRESIDENTS 2009 NPC Conference. 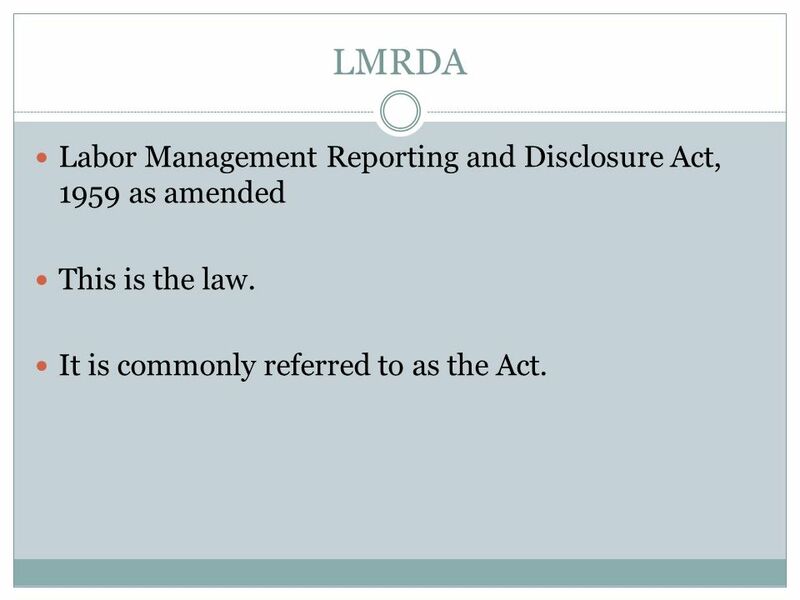 5 LMRDA Labor Management Reporting and Disclosure Act, 1959 as amended This is the law. It is commonly referred to as the Act. 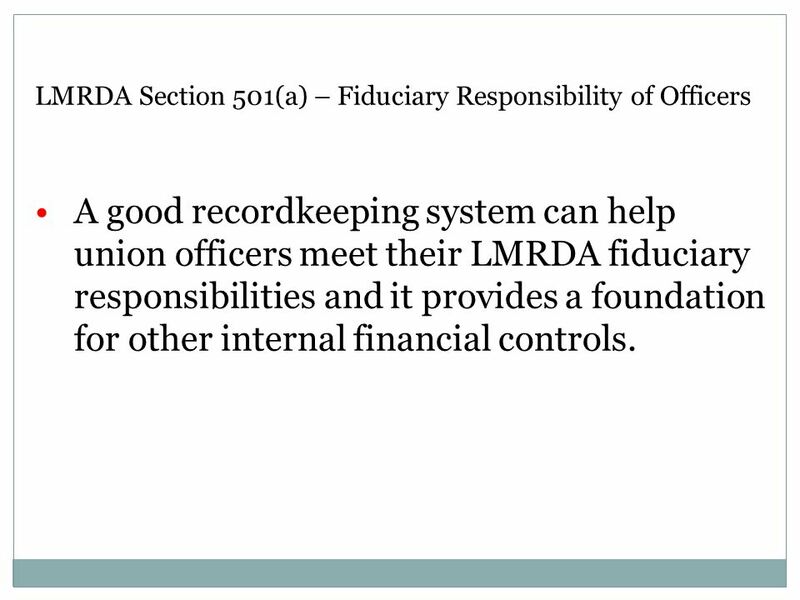 9 LMRDA Section 501(a) – Fiduciary Responsibility of Officers A good recordkeeping system can help union officers meet their LMRDA fiduciary responsibilities and it provides a foundation for other internal financial controls. 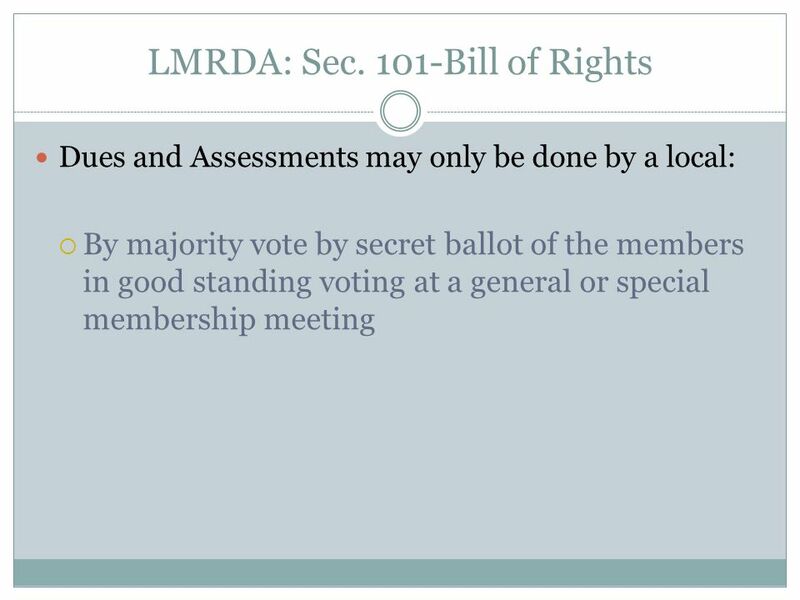 10 LMRDA: Sec. 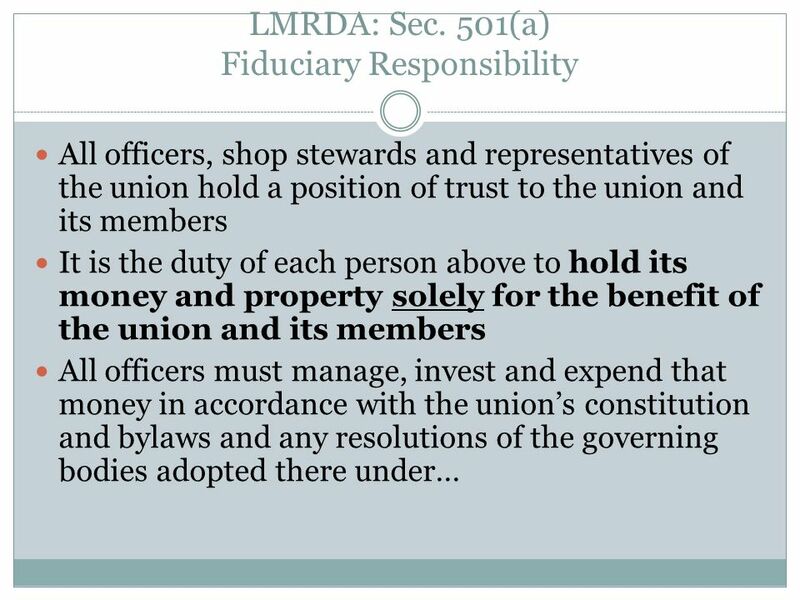 501(b) Fiduciary Responsibility All officers, shop stewards and representatives are obligated to recover damages to the union If you refuse or fail to do so within a reasonable time after being requested to do so by any union member, such member may sue such officer, shop steward or representative in any district or state court to recover damages. 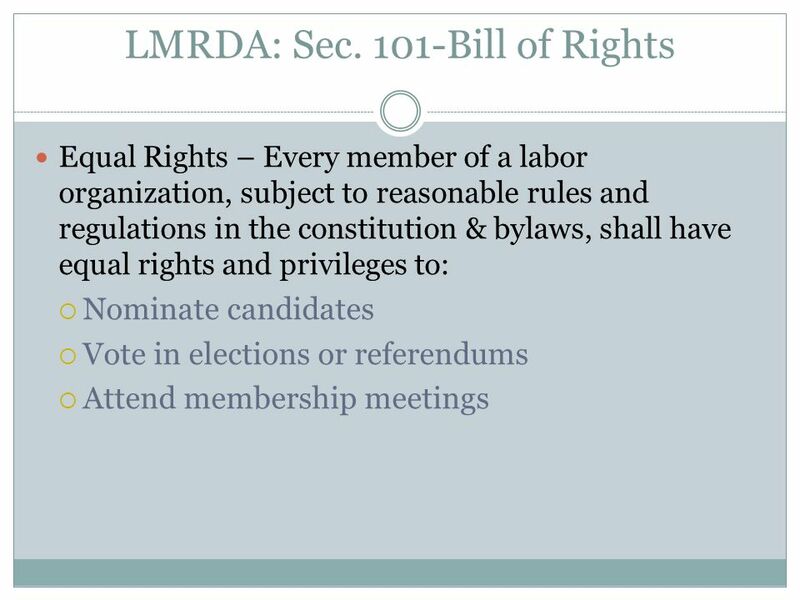 11 LMRDA: Sec. 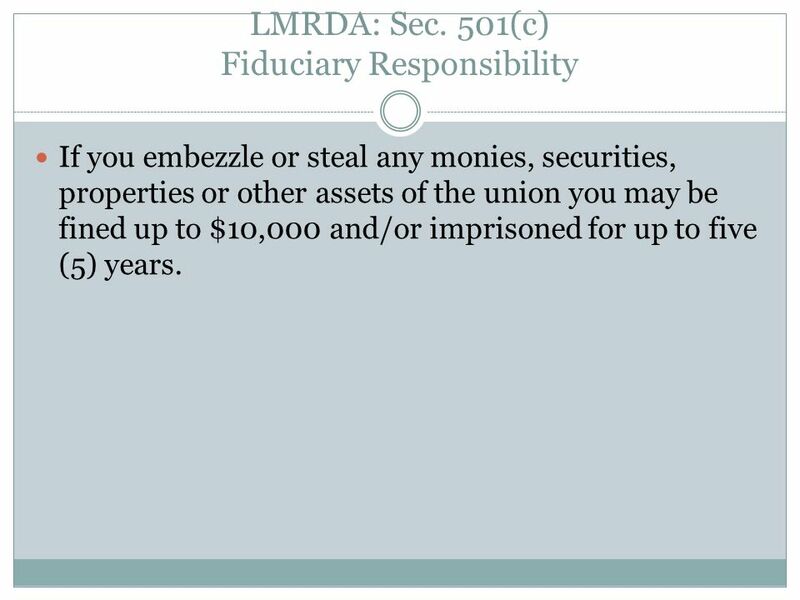 501(c) Fiduciary Responsibility If you embezzle or steal any monies, securities, properties or other assets of the union you may be fined up to $10,000 and/or imprisoned for up to five (5) years. 15 LMRDA: Sec. 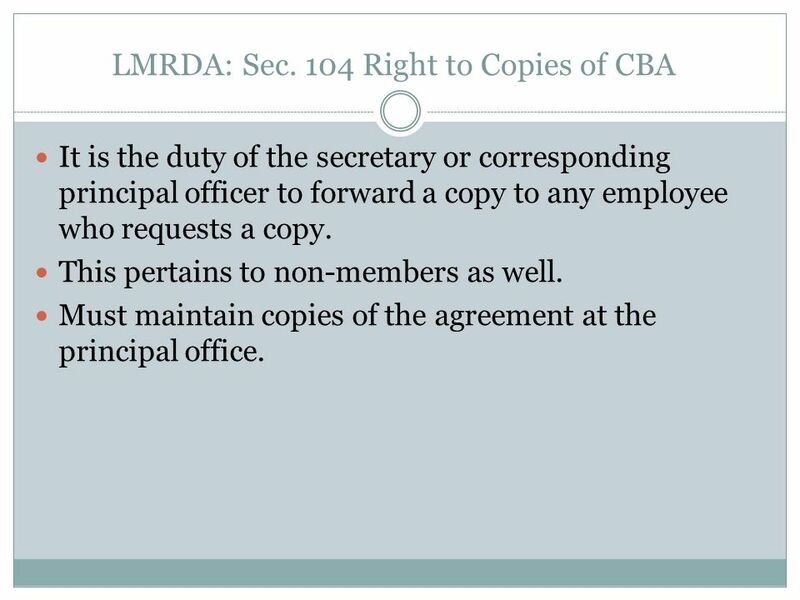 104 Right to Copies of CBA It is the duty of the secretary or corresponding principal officer to forward a copy to any employee who requests a copy. This pertains to non-members as well. Must maintain copies of the agreement at the principal office. 17 LMRDA: Sec. 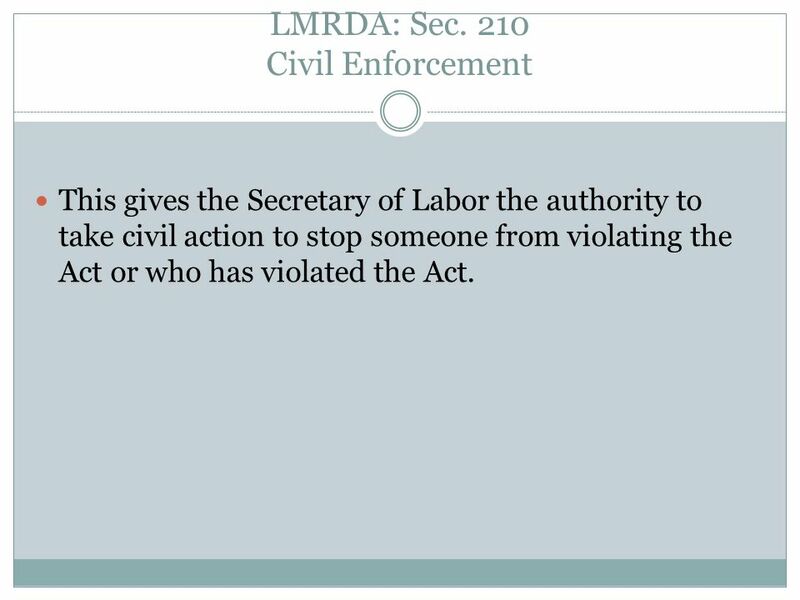 210 Civil Enforcement This gives the Secretary of Labor the authority to take civil action to stop someone from violating the Act or who has violated the Act. 18 LMRDA: Sec. 207 Effective Date (i.e. 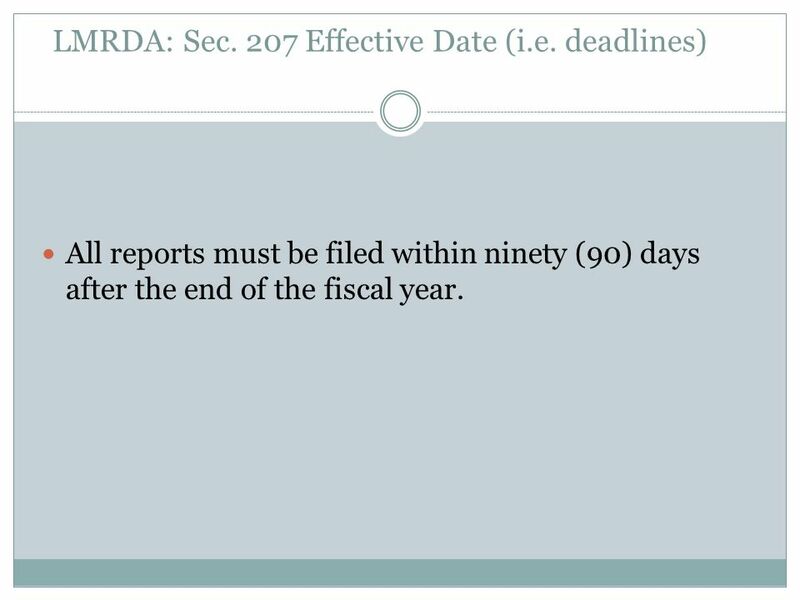 deadlines) All reports must be filed within ninety (90) days after the end of the fiscal year. 19 LMRDA: Sec. 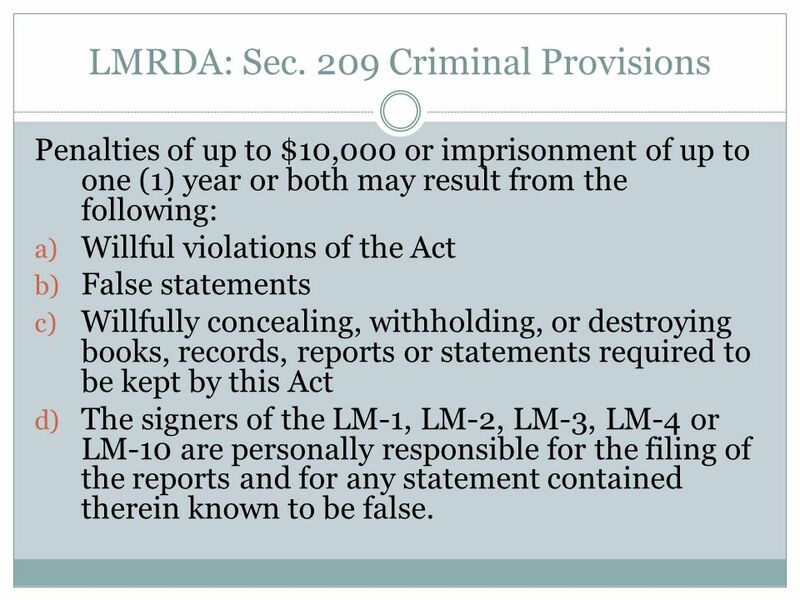 209 Criminal Provisions Penalties of up to $10,000 or imprisonment of up to one (1) year or both may result from the following: a) Willful violations of the Act b) False statements c) Willfully concealing, withholding, or destroying books, records, reports or statements required to be kept by this Act d) The signers of the LM-1, LM-2, LM-3, LM-4 or LM-10 are personally responsible for the filing of the reports and for any statement contained therein known to be false. 20 Donts and Dos Do get a professional that really knows this form. The time (and grief) savings more than offset the expenses. 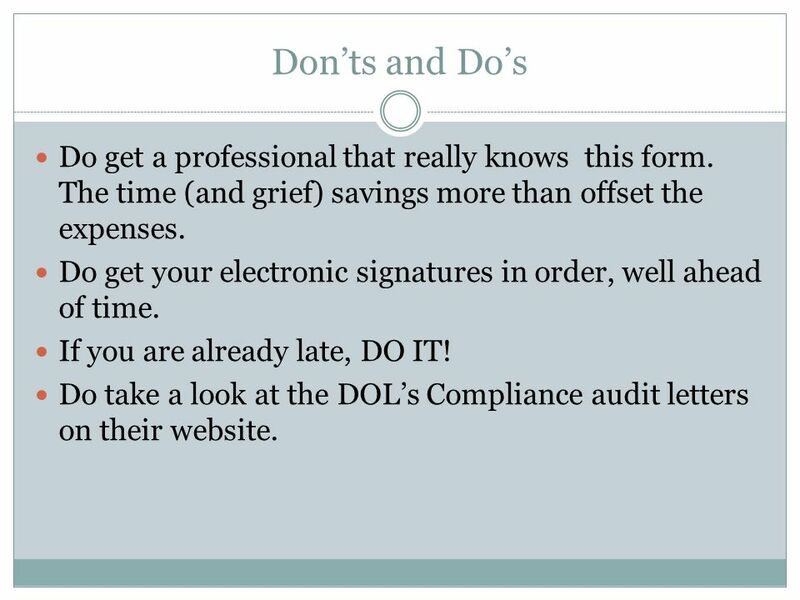 Do get your electronic signatures in order, well ahead of time. If you are already late, DO IT! 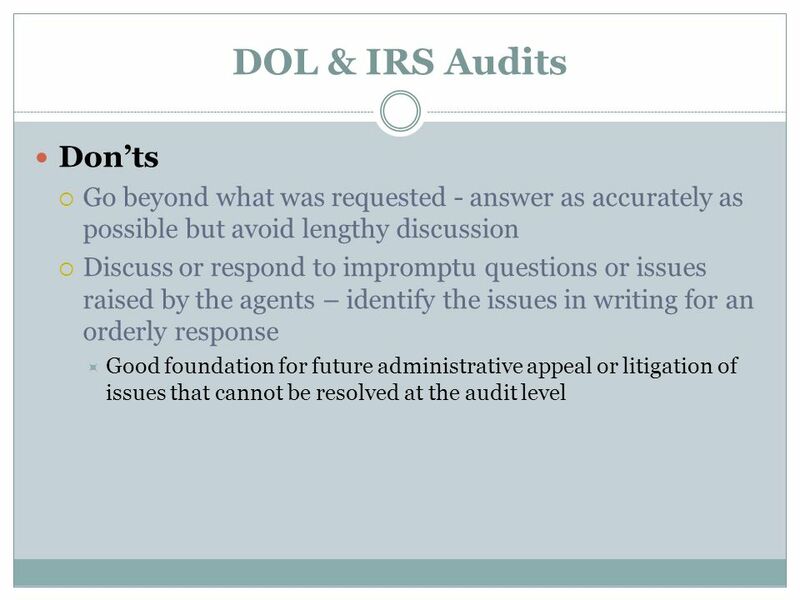 Do take a look at the DOLs Compliance audit letters on their website. 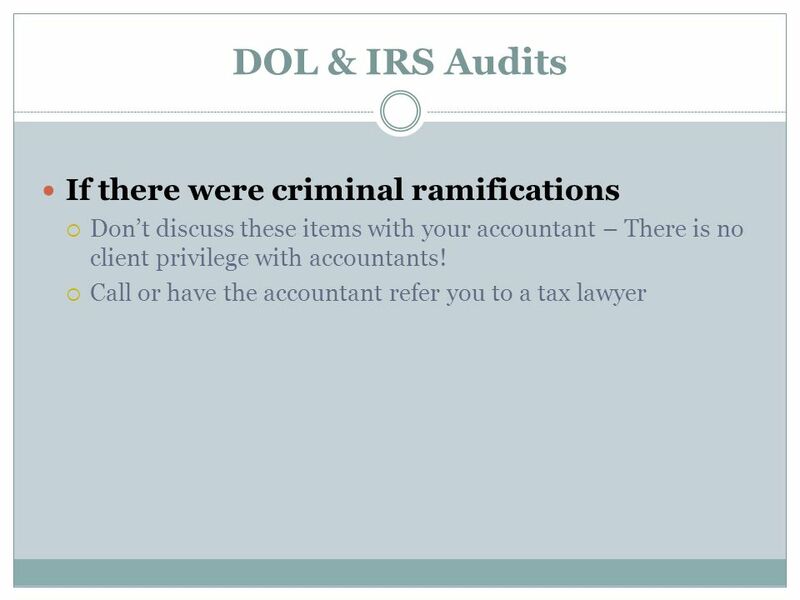 22 When the DOL inspects local finances and spending, they want to examine your records. 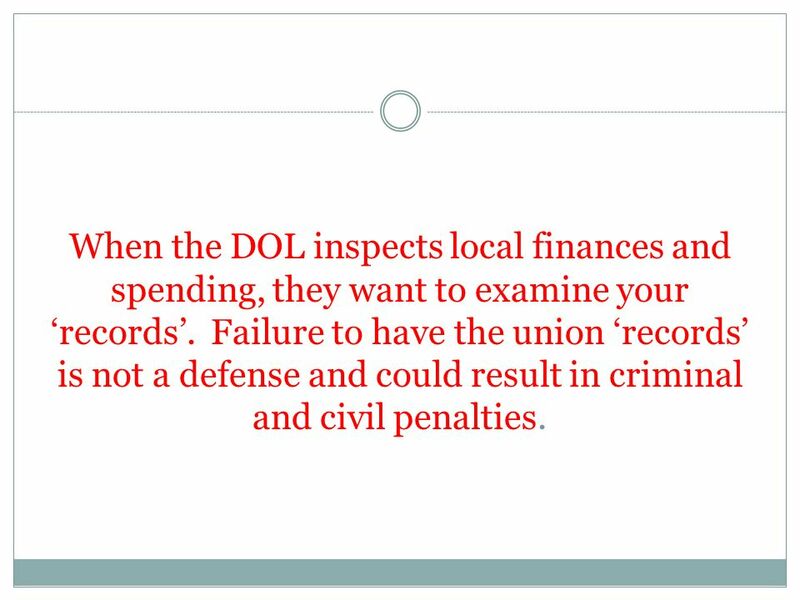 Failure to have the union records is not a defense and could result in criminal and civil penalties. 23 LMRDA: Sec. 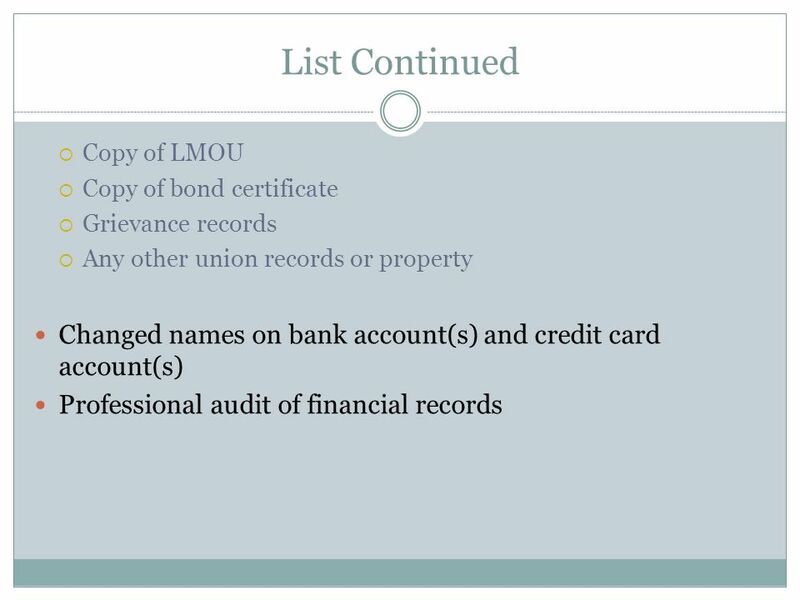 206 Retention of Records All records that include information that is require to file any of the reports mentioned in this act, must be retained for five (5) years. 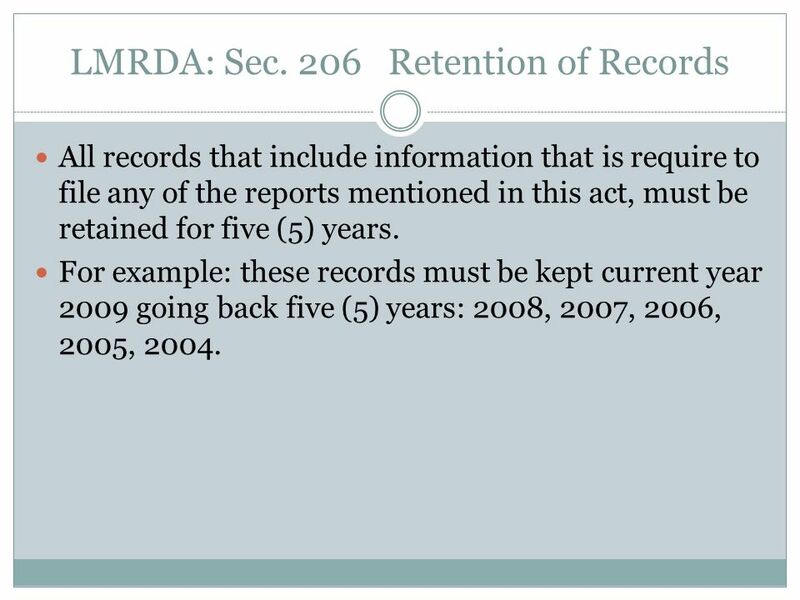 For example: these records must be kept current year 2009 going back five (5) years: 2008, 2007, 2006, 2005, 2004. 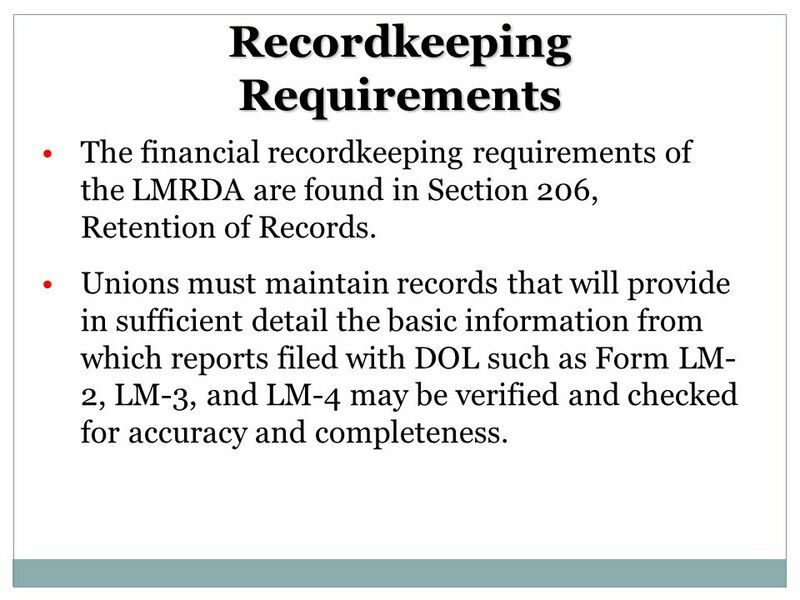 24 Recordkeeping Requirements The financial recordkeeping requirements of the LMRDA are found in Section 206, Retention of Records. 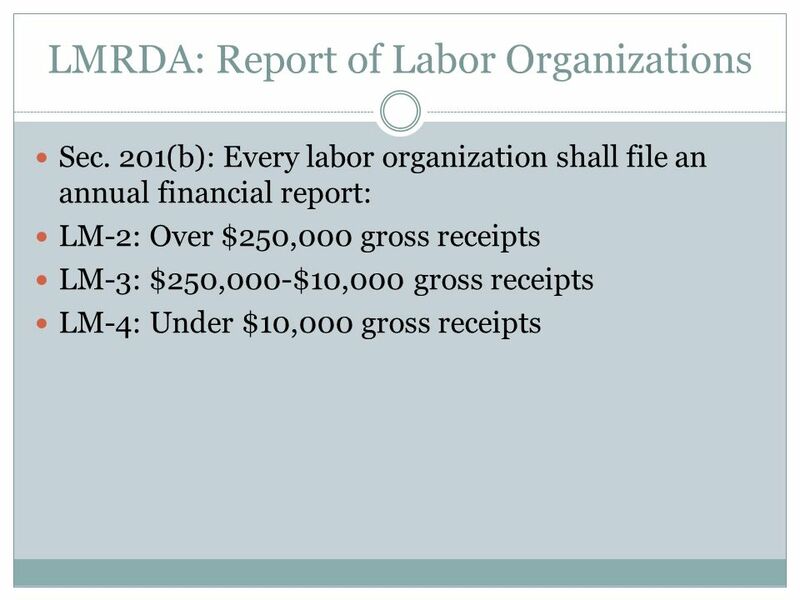 Unions must maintain records that will provide in sufficient detail the basic information from which reports filed with DOL such as Form LM- 2, LM-3, and LM-4 may be verified and checked for accuracy and completeness. 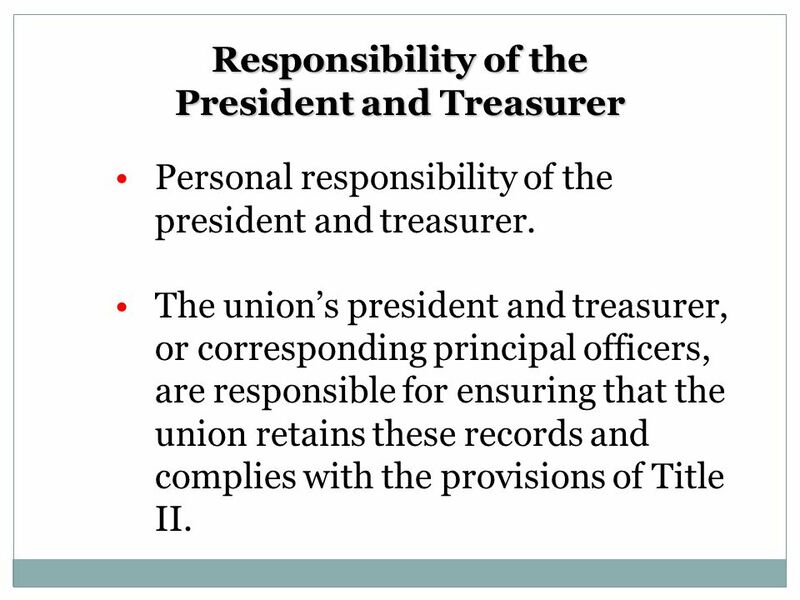 25 Responsibility of the President and Treasurer Personal responsibility of the president and treasurer. 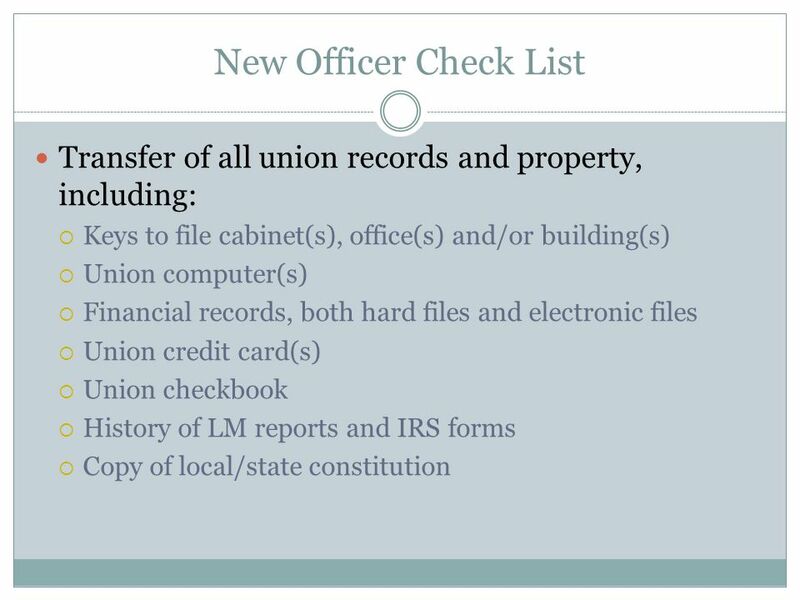 The unions president and treasurer, or corresponding principal officers, are responsible for ensuring that the union retains these records and complies with the provisions of Title II. 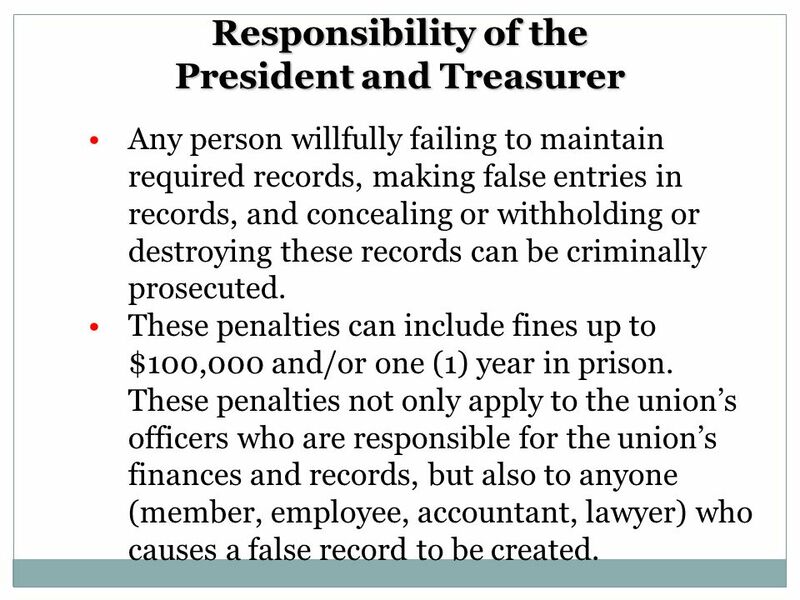 26 Responsibility of the President and Treasurer Any person willfully failing to maintain required records, making false entries in records, and concealing or withholding or destroying these records can be criminally prosecuted. 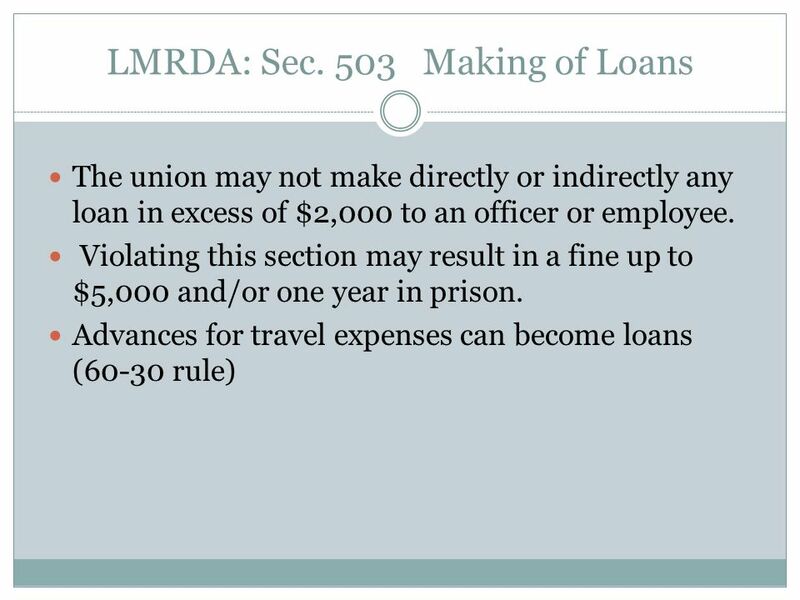 These penalties can include fines up to $100,000 and/or one (1) year in prison. 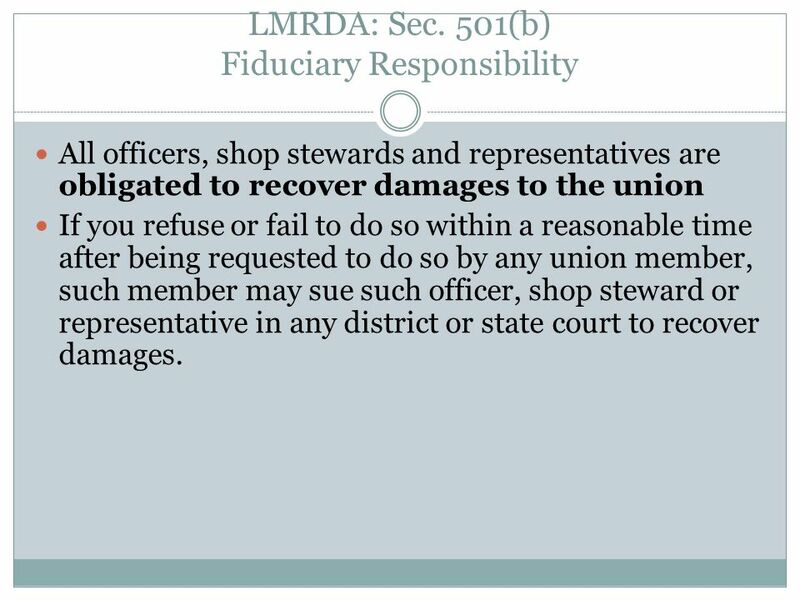 These penalties not only apply to the unions officers who are responsible for the unions finances and records, but also to anyone (member, employee, accountant, lawyer) who causes a false record to be created. 27 What records must be maintained? 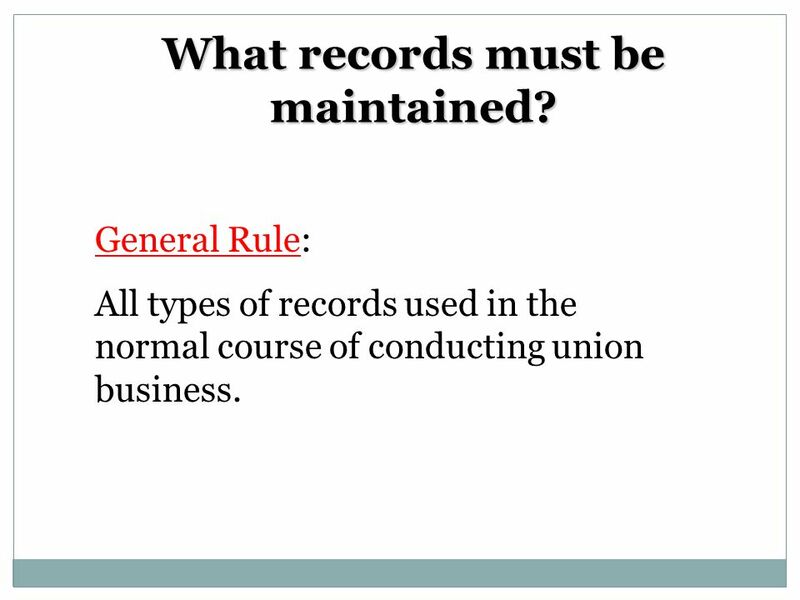 General Rule: All types of records used in the normal course of conducting union business. 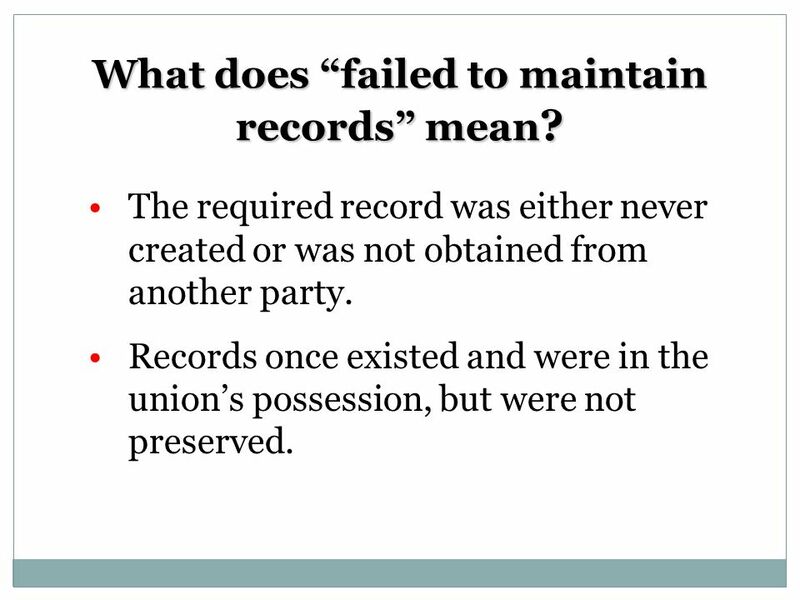 29 What does failed to maintain records mean ? The required record was either never created or was not obtained from another party. Records once existed and were in the unions possession, but were not preserved. 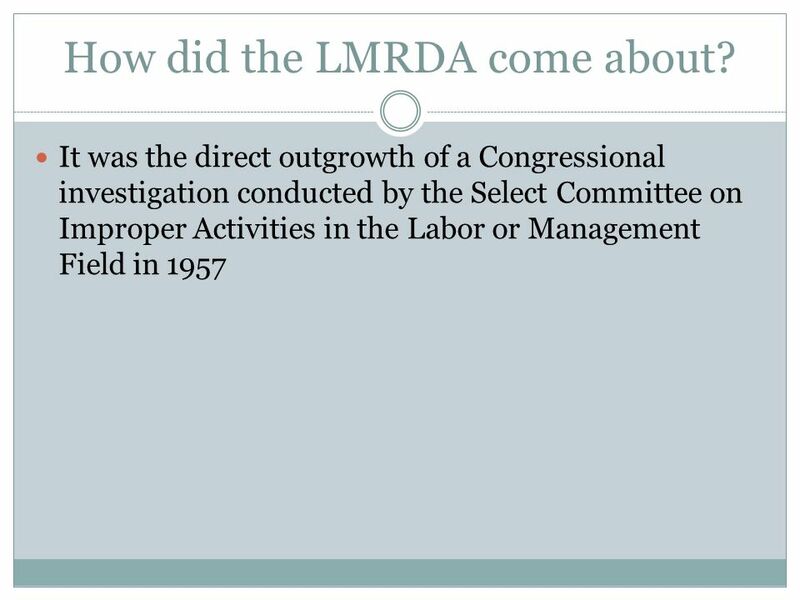 30 LMRDA: Report of Labor Organizations Sec. 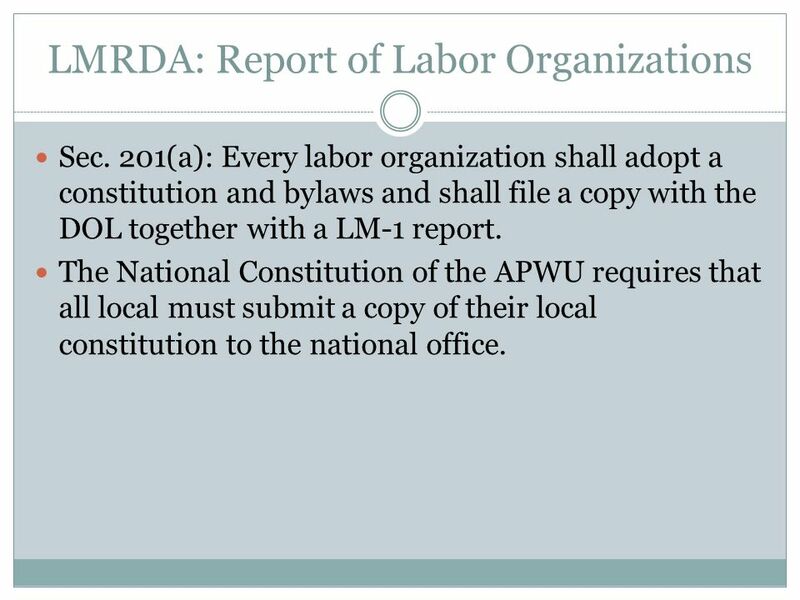 201(a): Every labor organization shall adopt a constitution and bylaws and shall file a copy with the DOL together with a LM-1 report. 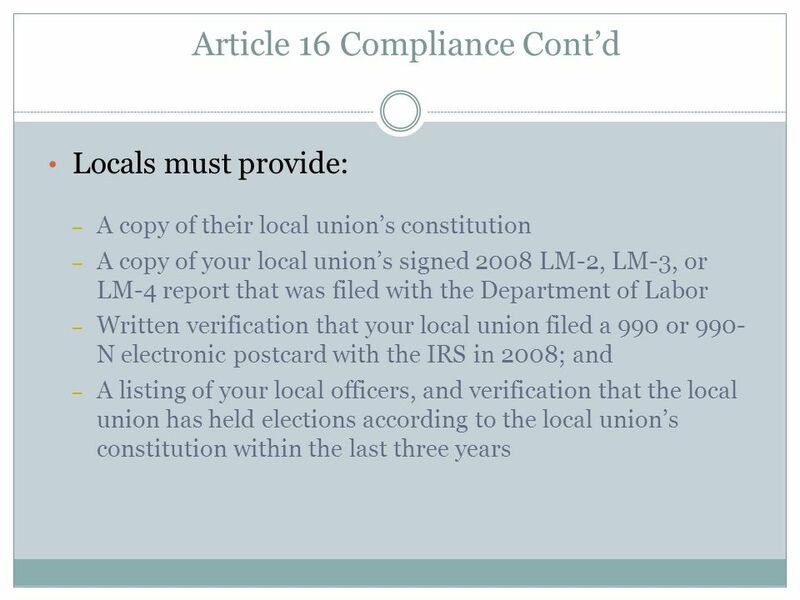 The National Constitution of the APWU requires that all local must submit a copy of their local constitution to the national office. 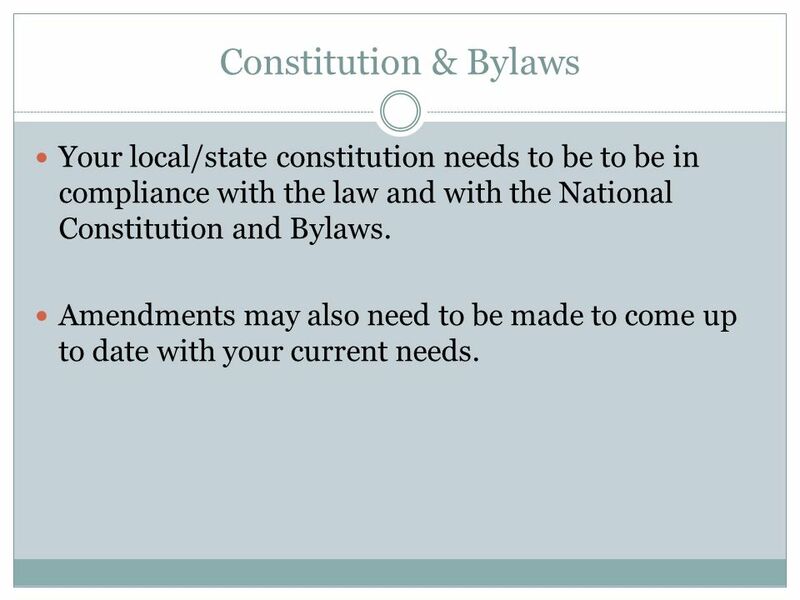 31 Constitution & Bylaws Your local/state constitution needs to be to be in compliance with the law and with the National Constitution and Bylaws. 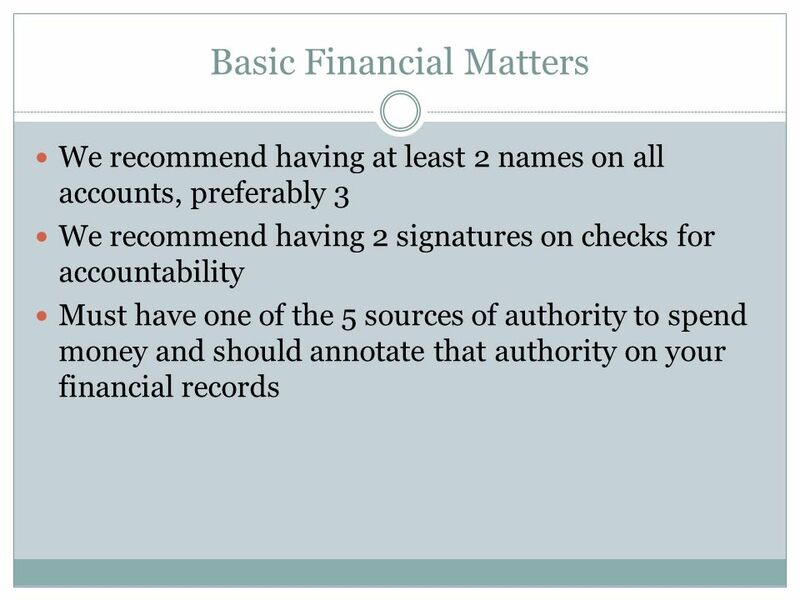 Amendments may also need to be made to come up to date with your current needs. 35 Credit Card/Debit Card We recommend that you only use credit cards for you local-with no authority for cash advances. 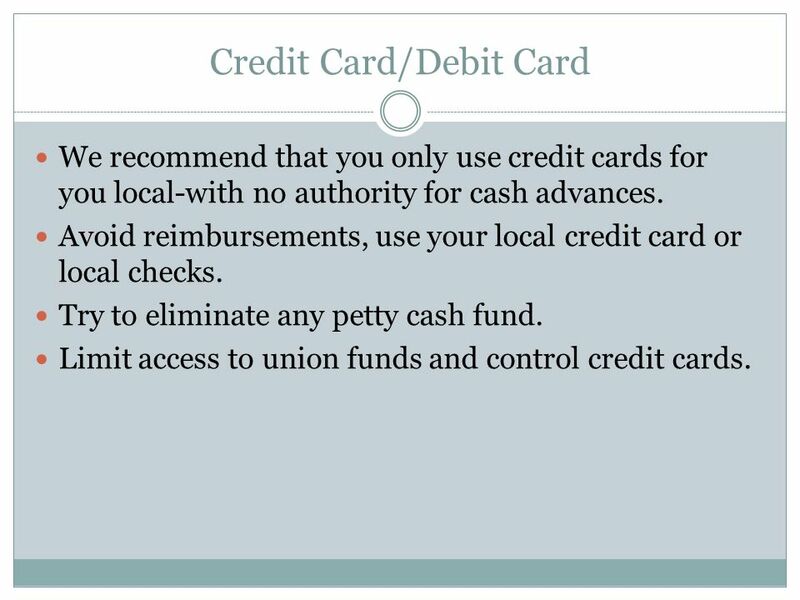 Avoid reimbursements, use your local credit card or local checks. Try to eliminate any petty cash fund. 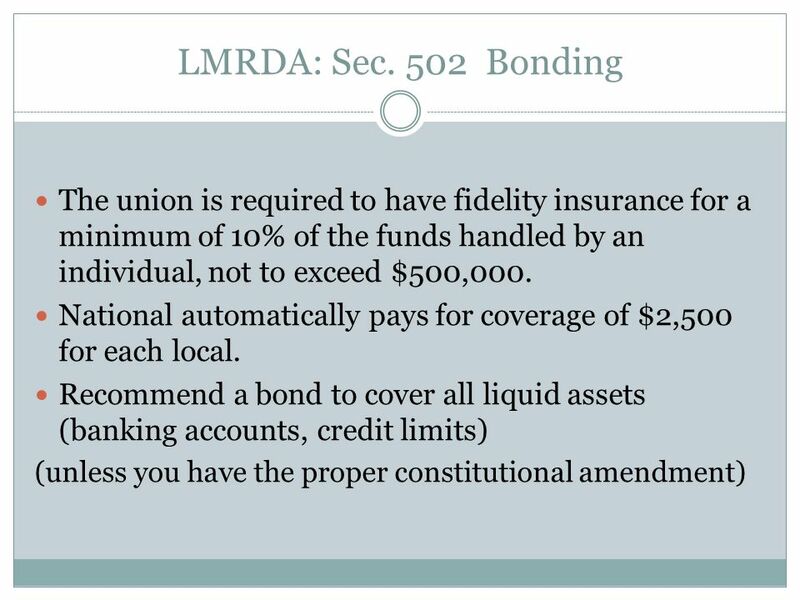 Limit access to union funds and control credit cards. 41 Who Should Approve the Budget ? 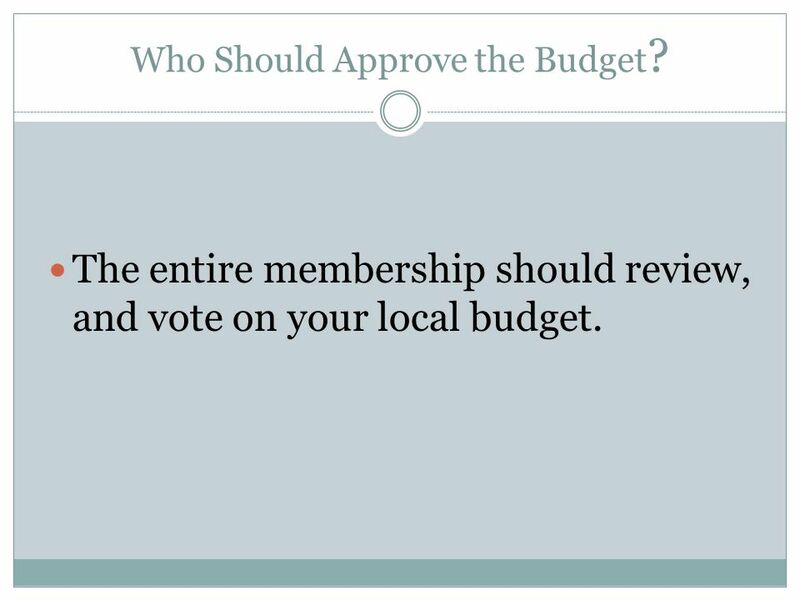 The entire membership should review, and vote on your local budget. 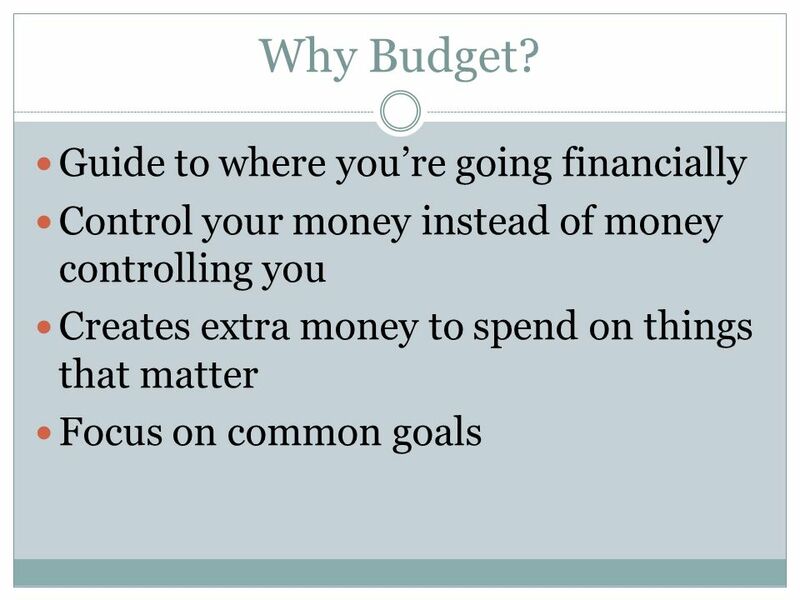 42 When Should a Budget Be Set? Near the End or at the Beginning of Your Fiscal Year. 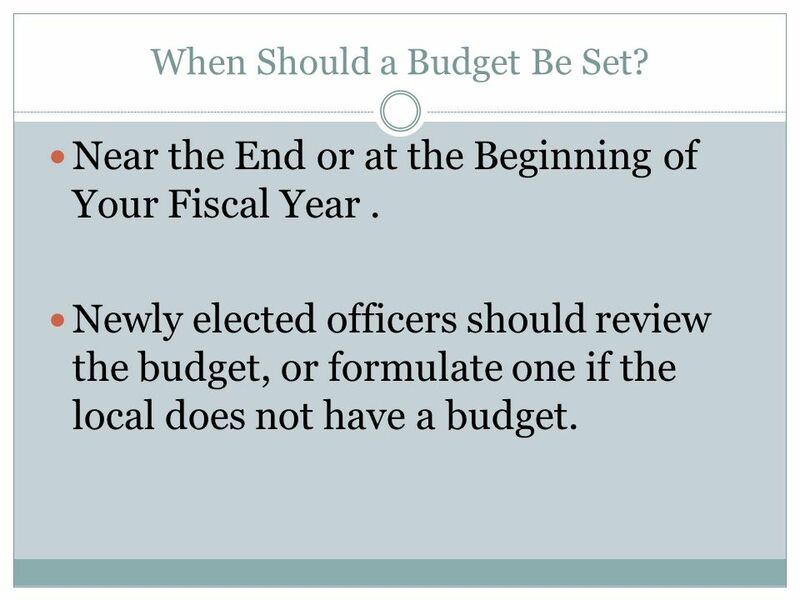 Newly elected officers should review the budget, or formulate one if the local does not have a budget. 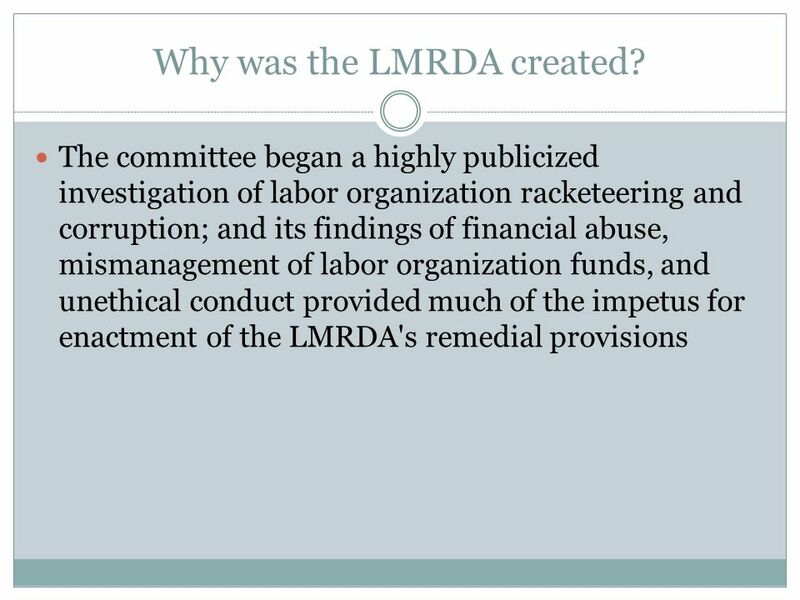 43 LMRDA: Report of Labor Organizations Sec. 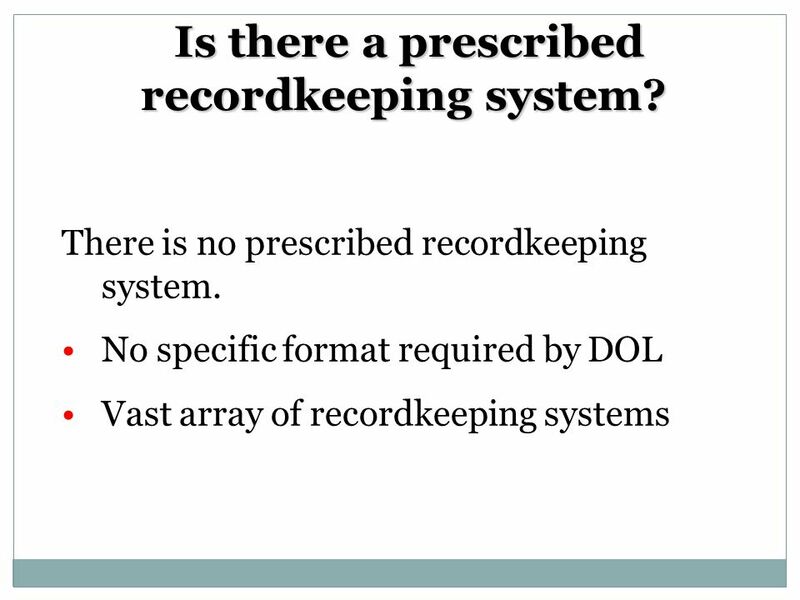 201(c): Right to examine records: the union shall make available the information required to be contained in these reports to any member for just cause to examine any books, records, and accounts necessary to verify such report. 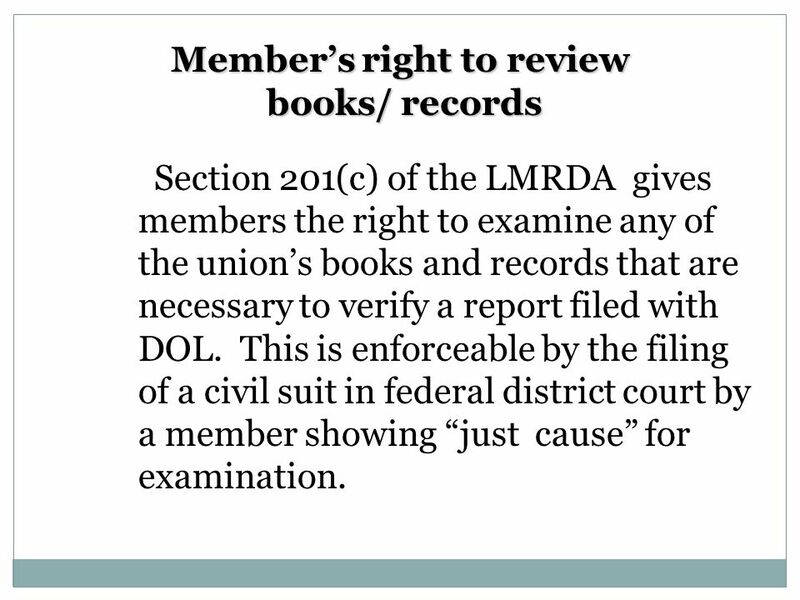 44 Members right to review books/ records books/ records Section 201(c) of the LMRDA gives members the right to examine any of the unions books and records that are necessary to verify a report filed with DOL. 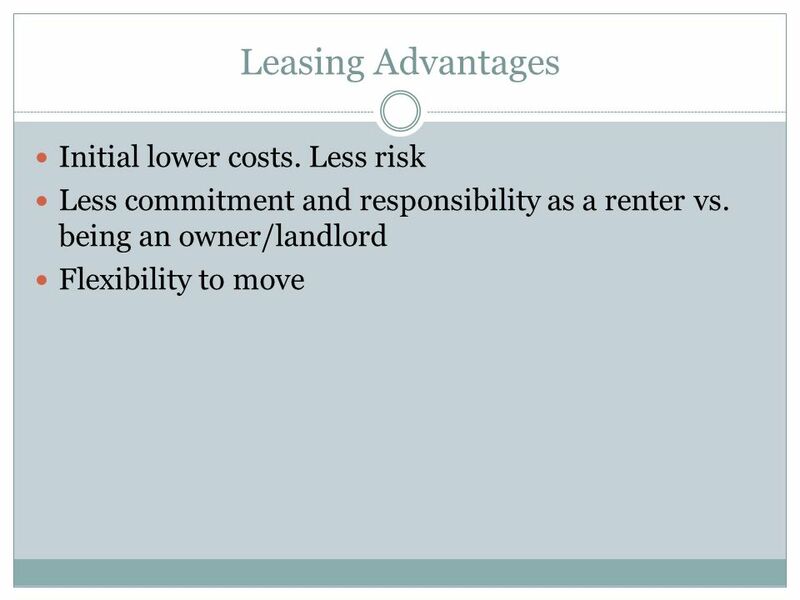 This is enforceable by the filing of a civil suit in federal district court by a member showing just cause for examination. 45 Owning vs. 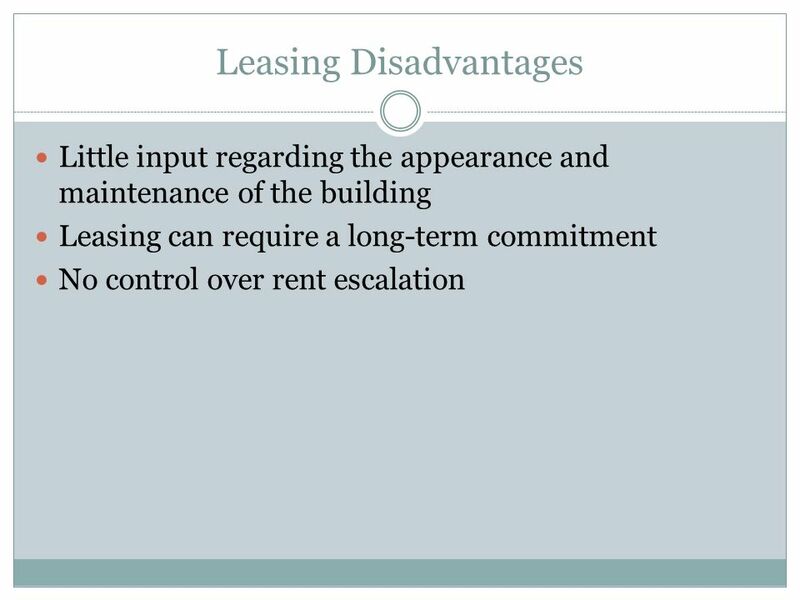 Renting Many local struggle with the decision about whether to buy a building or lease commercial space for their union hall. 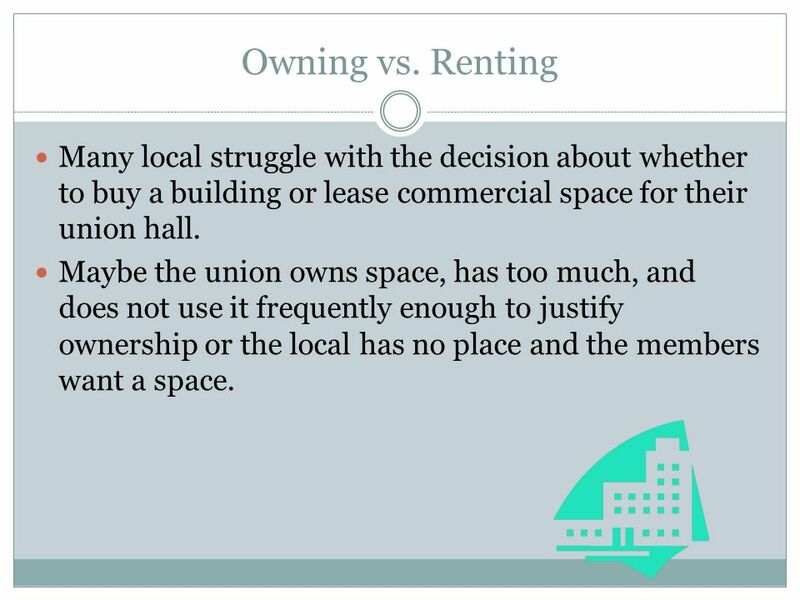 Maybe the union owns space, has too much, and does not use it frequently enough to justify ownership or the local has no place and the members want a space. 50 What are your needs? How many fulltime officers do you have? How many part-time officers do you have? Could officers share an office/work space? Do you need to hold union meetings at the union hall? 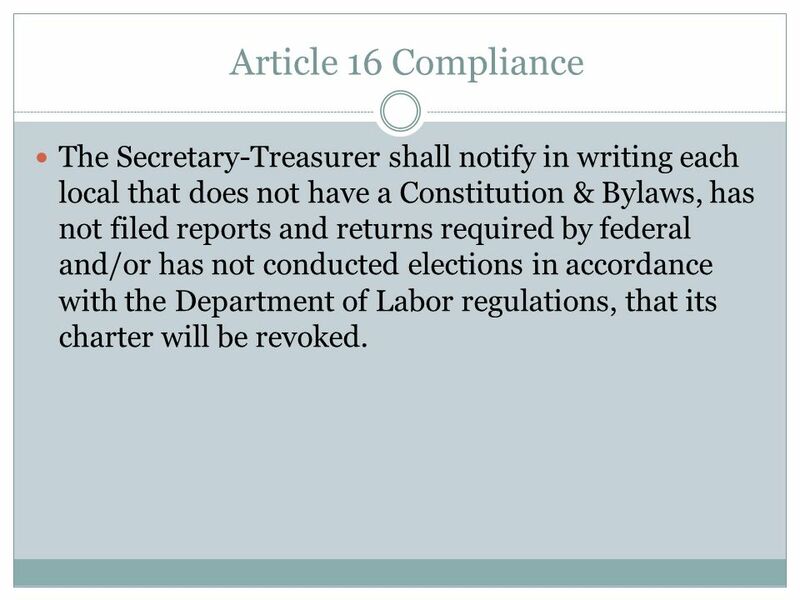 52 Article 16 Compliance The Secretary-Treasurer shall notify in writing each local that does not have a Constitution & Bylaws, has not filed reports and returns required by federal and/or has not conducted elections in accordance with the Department of Labor regulations, that its charter will be revoked. 57 Be very careful of the they owe me mentality. You volunteered for this job, thats a responsibility you took. 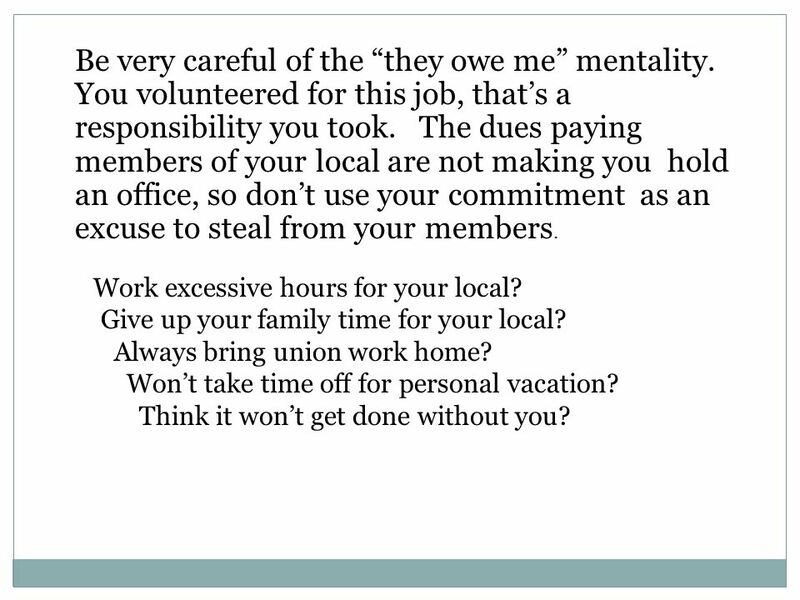 The dues paying members of your local are not making you hold an office, so dont use your commitment as an excuse to steal from your members. Work excessive hours for your local? Give up your family time for your local? Always bring union work home? Wont take time off for personal vacation? Think it wont get done without you? 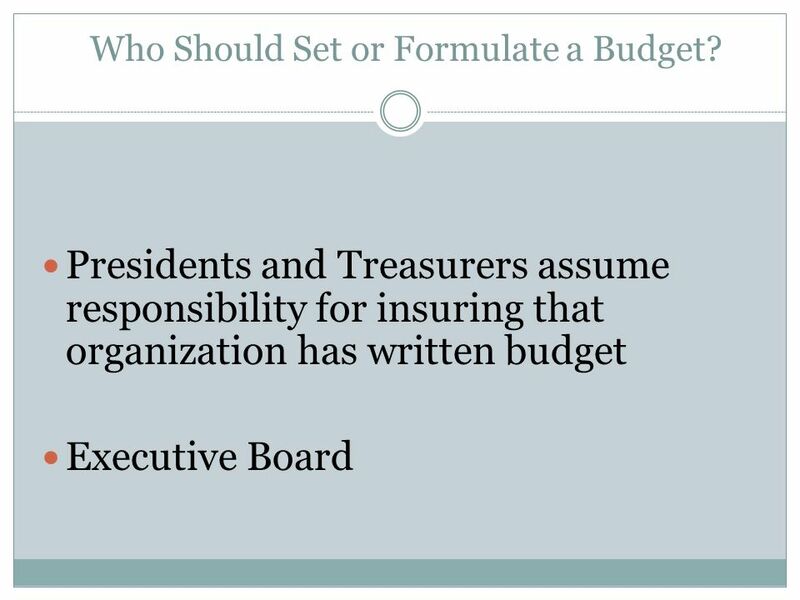 Download ppt "FINANCIAL RESPONSIBILITIES OF LOCAL PRESIDENTS 2009 NPC Conference." Council of Prison Locals – C33 FIDICUARY RESPONSIBILITES PRESENTED BY NST- Roger Payne. 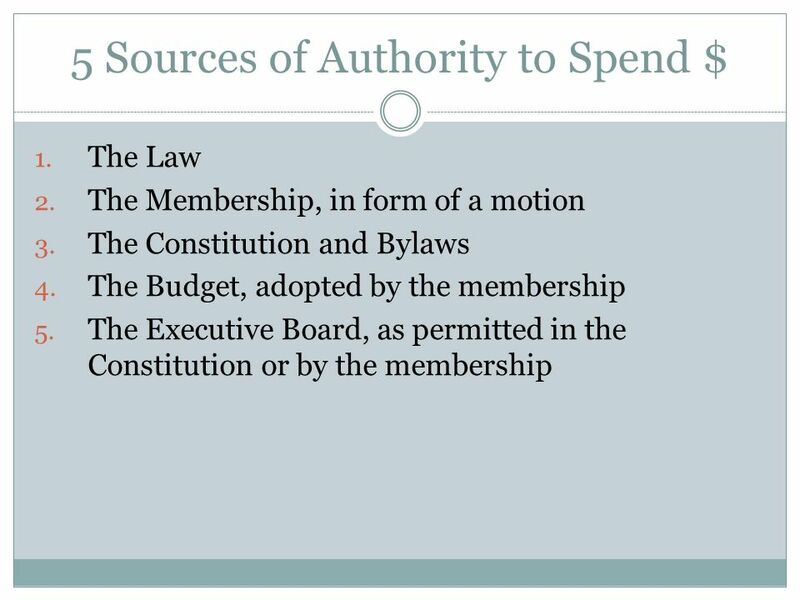 Appendix B* AFGE National Constitution Standard Local Constitution * Only Articles of the Constitution that are related to the Financial Officers are Covered. PTA LOCAL UNIT TREASURER. 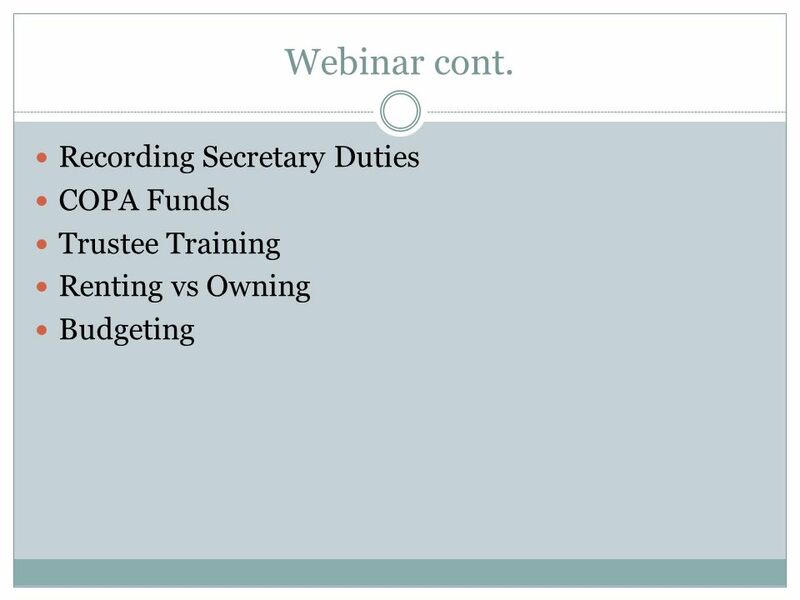 DUTIES OF A TREASURER ASSIST IN DEVELOPING A BUDGET ASSIST IN DEVELOPING A BUDGET MANAGE THE FUNDS OF THE UNIT MANAGE THE FUNDS. Session 1: Club Treasurer Role and Responsibilities. OFFICERS DUTIES THE POST QUARTERMASTER. THE POST QUARTERMASTER IS ONE OF THE MOST IMPORTANT OFFICERS IN THE POST. 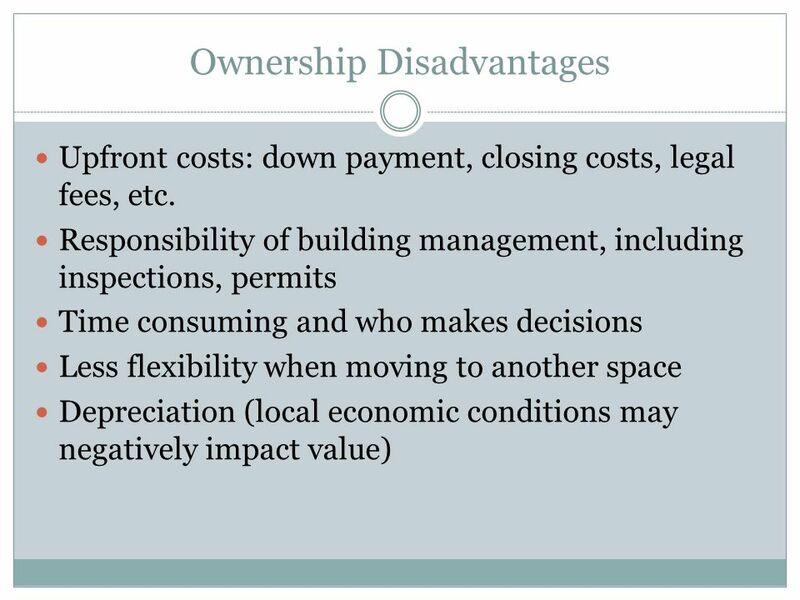 Conservation District Supervisor Accreditation Module 2: District Clerk: Roles & Responsibilities. Best Management Practices Developed by: Texas 4-H & Youth Development Strengthening Clubs Initiative Team. Wing Banker Program. 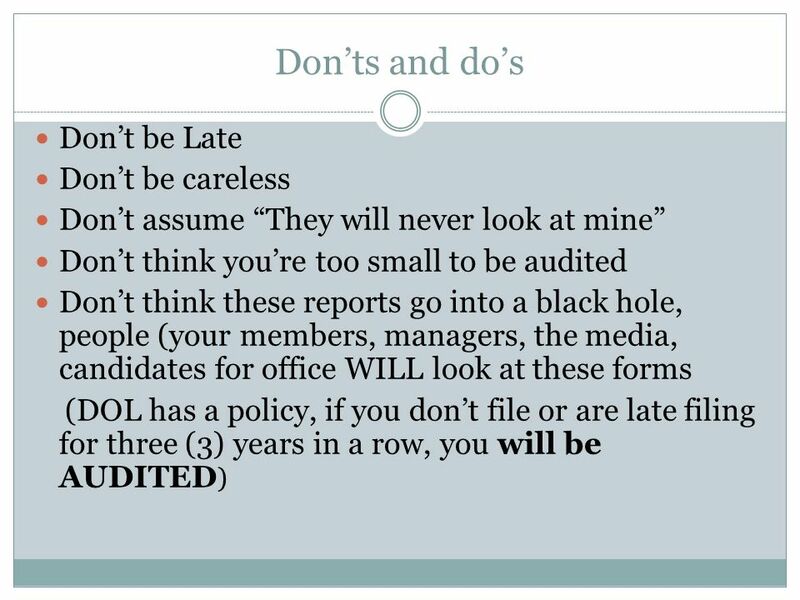 In the Beginning… CAP has never received an Unqualified Audit Opinion because the funds at the unit level are not audited The NEC. Prepared by. 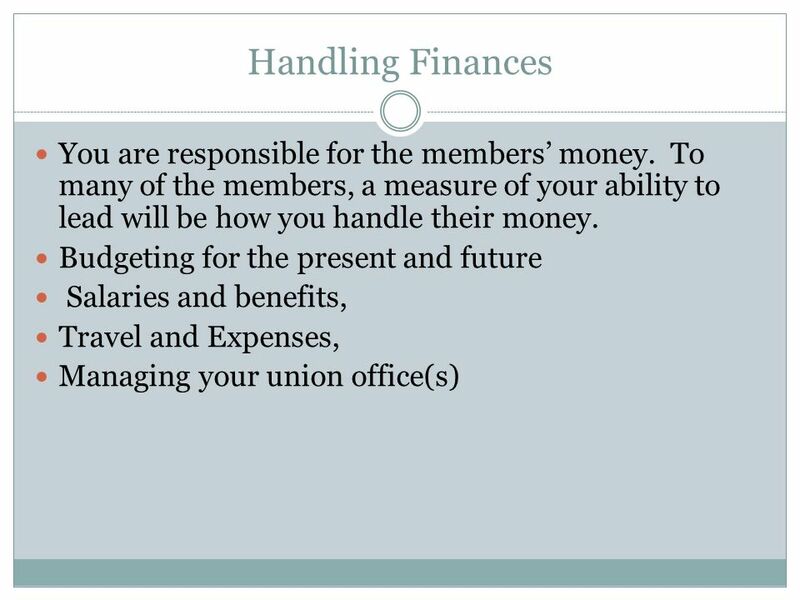 As stewards of a chapter’s money the chapter officers are responsible for the careful handling and dissemination of funds. 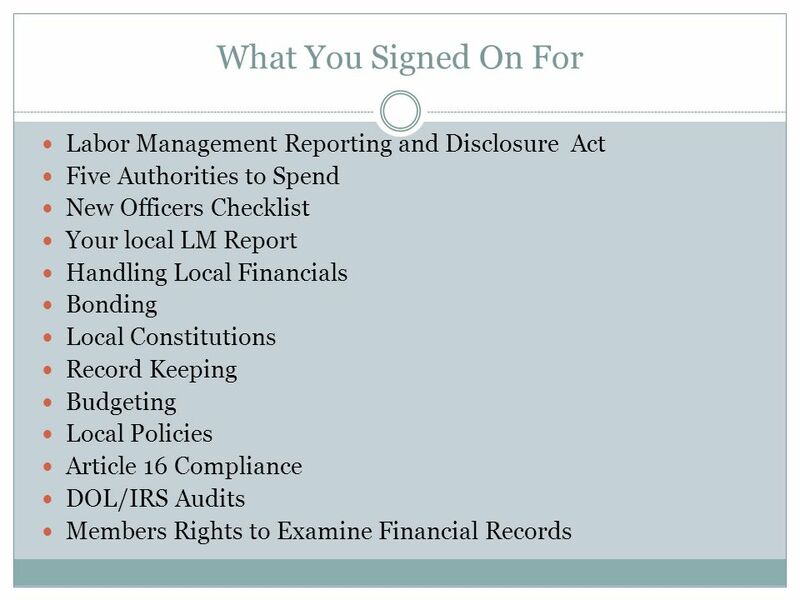 LOCAL OFFICIAL FINANCIAL RESPONSIBILITIES UNDER NAGE CONSTITUTION AND BY-LAWS AND DEPARTMENT OF LABOR/IRS RULES DRAFT. 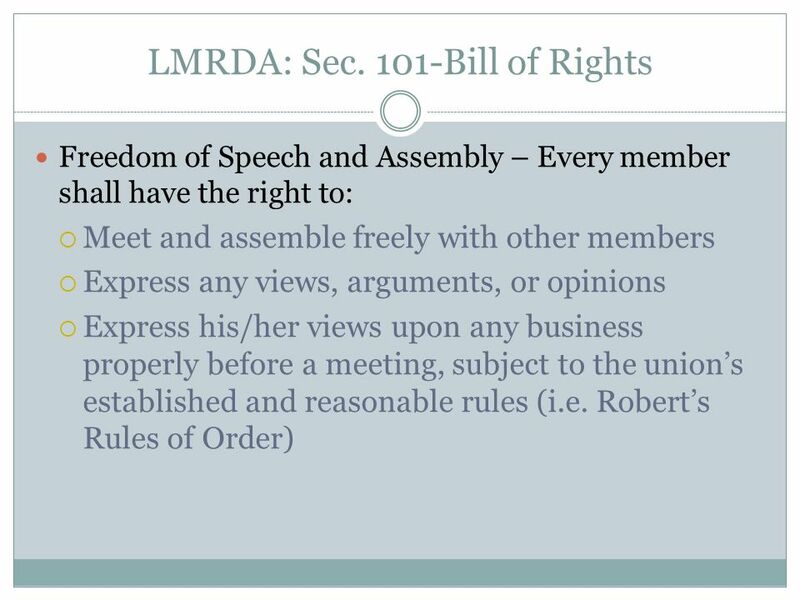 BYLAWS Missouri PTA. 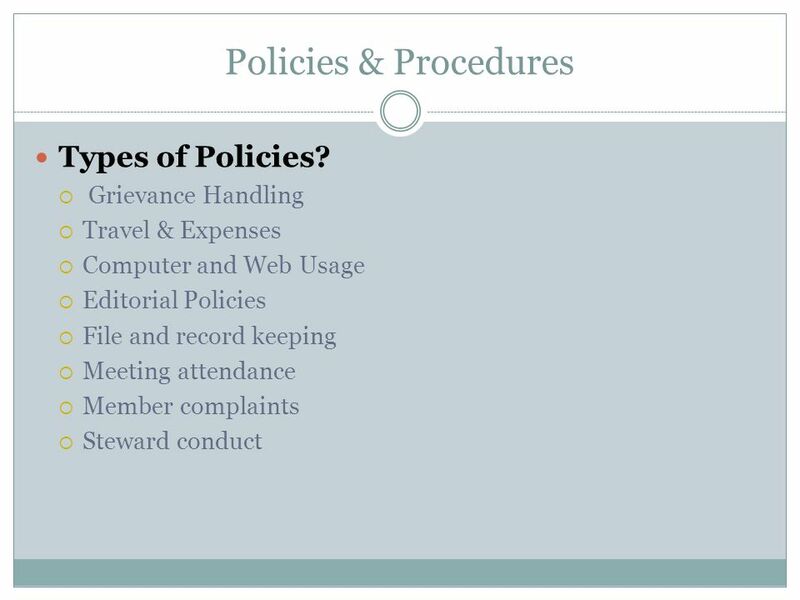 BYLAWS For many PTA`s, their bylaws are just some forgotten document, full of legalese, gathering dust in a file cabinet somewhere. 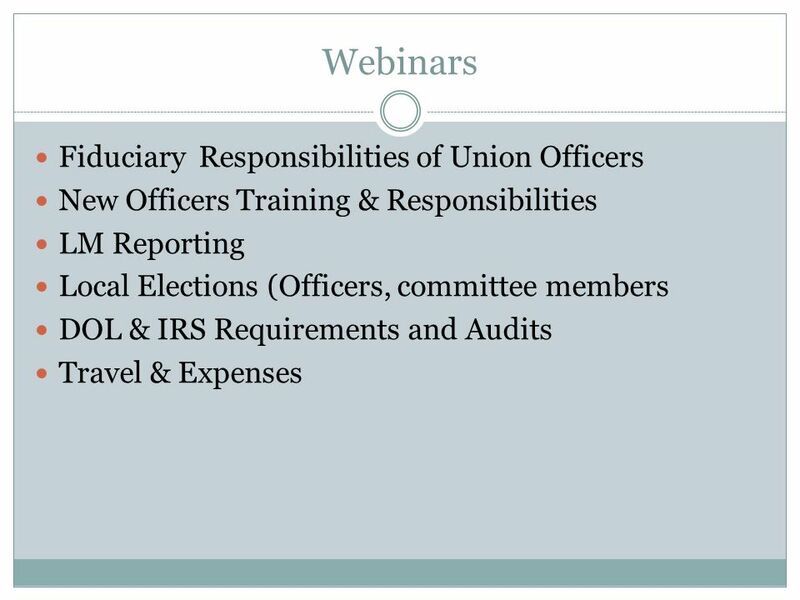 AFSA Chapter Officer Training Module 1 Officer Roles and Responsibilities.